Our audience by subscription is students, graduate students and teachers of leading Russian and foreign universities, and among the visitors from outside are people with higher education aged 22-55, see Our reader. 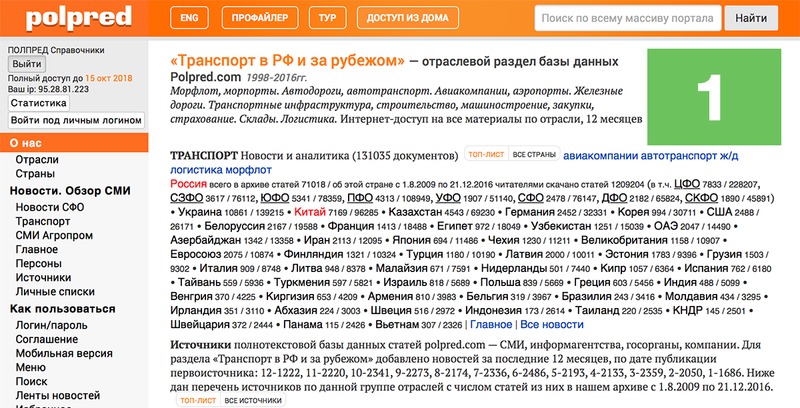 Detailed information on visits, view, audience composition (geography, interests, demographics, activity, loyalty), visits of sections (popular, visit parameters, behavior), technologies (browsers, operating systems, devices) and other monitoring reports see Yandex.Metrica and Openstat. The information is provided only for your reference. For all questions and suggestions for buying advertising space, please contact us at info@polpred.com. We are ready to discuss individual placement conditions. Prices are without VAT and are valid since Jan 1, 2017. Size: Banner 970x90px or 468x60px, or banner with a height of up to 200px and a width of up to 100% of the screen. Placement options: «through-out; on all pages of the portal polpred.com; only on the main page. Price: 10000 euro (700 000 rub.) per month — through-out, 5000 euro (350 000 rub.) only on the main page. Cost per thousand impressions (CPM): on the main 700 rubles, through-out 400 rubles. Placement: "through-out", is on all pages of the portal polpred.com, up to 3 banners. File format: JPG, PNG, GIF. The banner can be animated (at least 5 seconds per frame) or replaced with a text block of the same size. Banner 200x130 px, Is located on any country or industry section. Price: 300 euro (21 000 rub.) per month. File format: JPG, PNG, GIF (up to 50 Кб). Animated banners are allowed (at least 5 seconds per frame). The banner can be replaced with a text block of the same size. The article will be posted in the section News. Mass Media Review. Publications are assigned an individual number, it remains in the database polpred.com. We do not post non-core advertising articles (on topics not included in our rubricator). In order to post an article marked "Affiliate material", we need to familiarize ourselves with its content and align it with our format. Announcement: the article can also be advertised by a link or banner on the selected site of the site, for an additional fee: the cost of placement corresponds to the cost of the advertising banner (see the tables above). 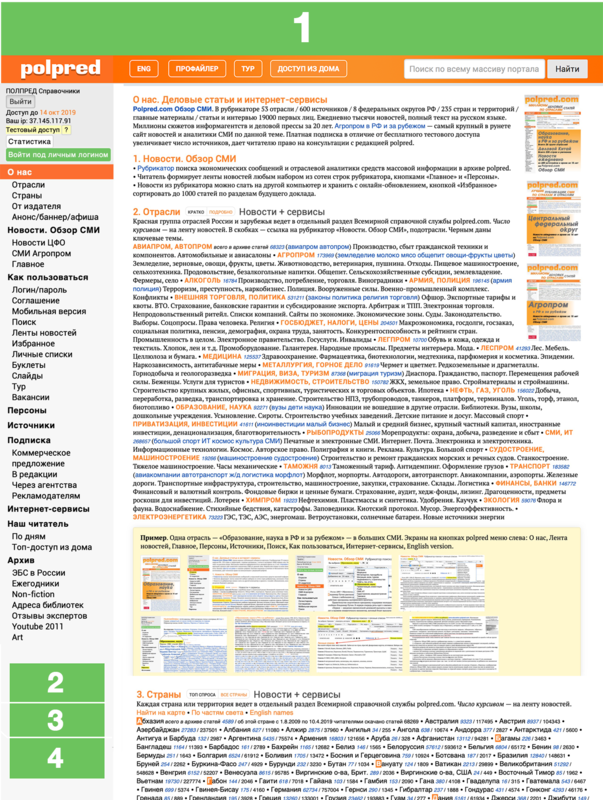 Text ad unit with links in the «footer» of the site. Cost of monthly placement — 300 euro (21 000 rub.). The options for placing a banner are agreed upon individually. This includes non-standard advertising formats. For example, interactive blocks, splash screens, combinations of banners and keywords (See the ad unit in the upper right corner of the «Ecology» section, move the mouse over the banner), write us to info@polpred.com. Please consider the possibility of placing your advertisements on the Polpred.com Media Review portal, which is daily visited by up to 12 thousand users. The services are used by the readers of university and public libraries with permanent access to polpred.com. Over the past eight years, the readers of 2000 libraries in the post-Soviet space have downloaded/viewed 38 million articles from polpred.com. There is a permanent link to polpred on 1500 websites of the leading Russian and CIS higher educational establishments: we render services to libraries in a free indefinite trial access mode; is we are paid, we increase the number of sources. You can familiarize yourself with our media registration and database certificates using the polpred menu State Registration section on the left. Library readers can use the sorting of our information array getting access from home or from any device. We daily mark out a thousand news in the search index list – our archives comprise 2.1 million articles for the past 15 years, this is the largest portal of quality information on the economy and industry sectors for all – use the News. Mass Media Review section on the left in the polpred website menu. We offer you end-to-end advertising options on the website, as well as ad slots in the most visited sections: 53 economic branches, Russia and its federal districts, 235 countries (the United States, China, Korea, Germany and so on). Another possible option is geographical and sectoral targeting of ad blocks, placement of both graphic banners and advertising text links, and on certain pages - site wide links all over the website. You can learn about the formats, prices and places for ads using the Advertise section on the left in the polpred menu. Information about views, visits, visitors, click-through sources, audience makeup (geography, interests, demography, activity, loyalty), traffic of the website sections (popular, visit parameters, conduct), technologies (browsers, operating systems, devices) and other reports on the website monitoring are available in open statistics of Yandex.Metrika and Openstat – at the end of the polpred menu. The polpred menu section on the left Our reader gives information about our readers, university students and teachers, as well as users of libraries..